CUMBERLAND LINCOLN EDITION | VALLEY BREEZE | NOVEMBER 8-14, 2018 17 1764 Mendon Road (McDonald's Plaza) Cumberland RI 02864 401-334-7317 www.cumberlandkitchen.com info@cumberlandkitchen.com Hours: Mon. 8:30 a.m.-5 p.m., Tue.-Thurs. 8:30 a.m.-7 p.m., Fri. 8:30 a.m.-5 p.m., Sat. 9 a.m.-4:30 p.m. Remember Our Veterans On behalf of our staff we would like to thank our military for their service. 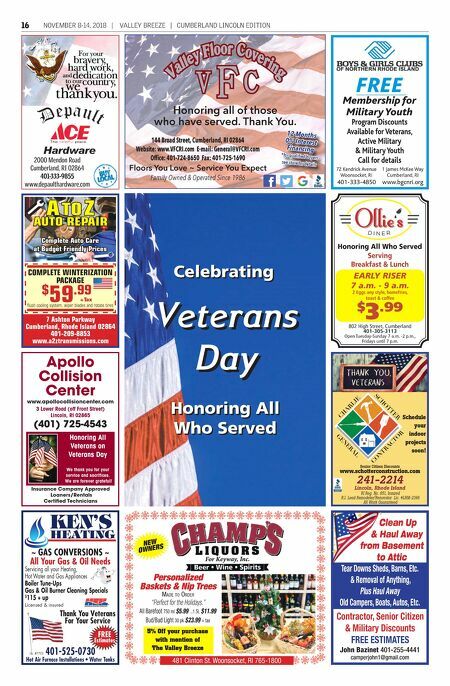 Free Coffee for All Veterans November 11, 2018 Everybody's Favorite Breakfast and Lunch 1370 Mendon Road Cumberland, RI 401-333-5035 HOURS: Mon., Wed., Fri. 6 a.m.-2 p.m. Sat. 6 a.m.-1 p.m. Sun. 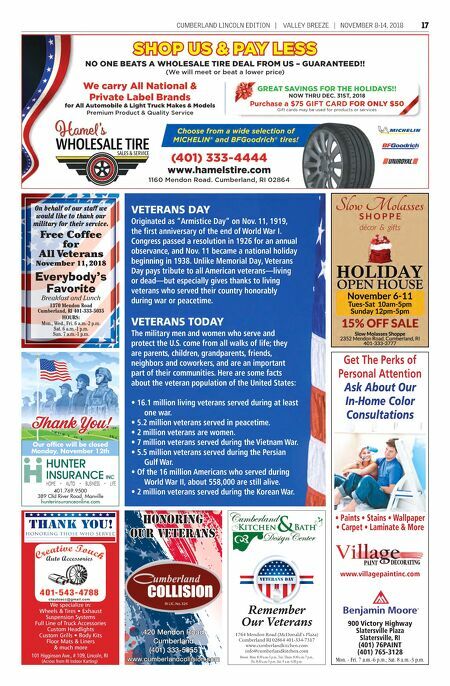 7 a.m.-1 p.m. 420 Mendon Road Cumberland (401) 333-5855 www.cumberlandcollision.com HONORING OUR VETERANS Our office will be closed Monday, November 12th 401.769.9500 389 Old River Road, Manville hunterinsuranceonline.com Thank You! Get The Perks of Personal Attention Ask About Our In-Home Color Consultations • Paints • Stains • Wallpaper • Carpet • Laminate & More www.villagepaintinc.com PAINT DECORATING & 900 Victory Highway Slatersville Plaza Slatersville, RI (401) 76PAINT (401) 765-3128 Mon. - Fri. 7 a.m.-6 p.m.; Sat. 8 a.m.-3 p.m. 101 Higginson Ave., # 109, Lincoln, RI (Across from RI Indoor Karting) We specialize in: Wheels & Tires • Exhaust Suspension Systems Full Line of Truck Accessories Custom Headlights Custom Grills • Body Kits Floor Mats & Liners & much more VETERANS DAY Originated as "Armistice Day" on Nov. 11, 1919, the first anniversary of the end of World War I. Congress passed a resolution in 1926 for an annual observance, and Nov. 11 became a national holiday beginning in 1938. Unlike Memorial Day, Veterans Day pays tribute to all American veterans—living or dead—but especially gives thanks to living veterans who served their country honorably during war or peacetime. VETERANS TODAY The military men and women who serve and protect the U.S. come from all walks of life; they are parents, children, grandparents, friends, neighbors and coworkers, and are an important part of their communities. Here are some facts about the veteran population of the United States: • 16.1 million living veterans served during at least one war. • 5.2 million veterans served in peacetime. • 2 million veterans are women. • 7 million veterans served during the Vietnam War. • 5.5 million veterans served during the Persian Gulf War. • Of the 16 million Americans who served during World War II, about 558,000 are still alive. • 2 million veterans served during the Korean War.